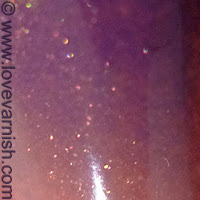 Love Varnish: Gradient with OPI Gouda Gouda Two Shoes & Dutch'ya Just Love OPI? Gradient with OPI Gouda Gouda Two Shoes & Dutch'ya Just Love OPI? Yes I love gradients too. They are everywhere and I freaking love them! When I didn't know what to polish this sunday, I thought I'd like to show you OPI Gouda Gouda Two Shoes. I wore it before but the pictures of it sucked so I didn't show it to you guys yet. But, when I noticed my bottle of OPI Dutch'ya Just Love OPI? next to it, I figured these looked quite pretty together. Especially since they have that gorgeous shimmer in both of them. So I combined them. Epic win! At least in my book. I hope you like it as much as I do! 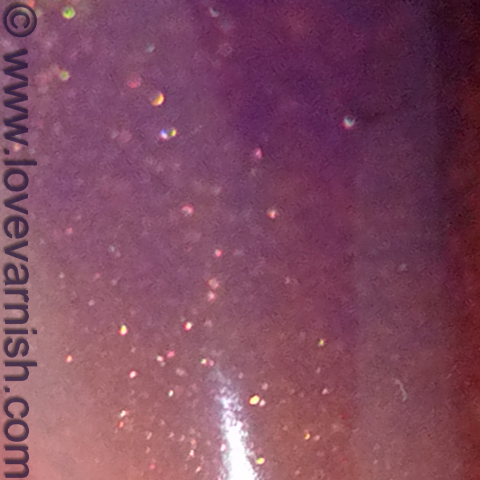 I used the tutorial by The Nailasaurus again for this one, just as I did with my previous gradient. I needed 2/3 rounds of sponging to get the purple nicely covered. Sometimes you have a gorgeous smooth gradient but the tips just don't seem opaque enough, just dip your sponge only into a bit of your tip color and do the whole gradient again, but just your tips! Way easier :). Oh. My. Gosh this is absolutely GORGEOUS! Oh, this is beautiful; I love it! it looks super pretty! I love those 2 colors together!! I'll have to try a gradient soon! Great colour choices. They are perfect for each other. These colors look really good together. OMG, this is gorgeous! One of the best gradients I have seen. This really is an awesome combo!! Oh my. I LOVE this!!!! Oh my, I'm drooling over this! What a great idea for a gradient! Very, very, very pretty. =) It almost looks like one of those color changing polishes. this is amazing! I may hold onto my gouda gouda now! Thank you Ivana, I do too! Especially since the shimmer in GGTS can be less visible when you normally wear it! Thanks girl, yes you should! Thank you for your sweet compliment :). Ooh that's such a sweet compliment, thanks! Oooh just try and you'll see it's not that hard! :D when are you doing a gradient? Thanks girl, I had the luck they were standing next to eachother ;). Thank you! I had a hard time with my first gradient and getting the tips nicely opaque - now I just go by thentip with just 1 color in the end to get them nice and even :). Thank you so much, that compliment is really sweet! Thanks Carmen, it really is a gorgeous polish :). Aww thanks! And I hope you can find something to recreate :).